In this tour MCO Artistic Partner Pekka Kuusisto joins the Mahler Chamber Orchestra for a concert programme of Ravel, Tchaikovsky and Beethoven which is performed in Torino, Neumarkt and Landshut. Pekka Kuusisto will lead the orchestra in Le Tombeau de Couperin of Ravel, and perform the Violin Concerto in D major op. 35 of Tchaikovsky. To conclude the programme the MCO will perform a concertmaster-led performance of Beethoven’s Seventh Symphony in A major, op. 92. Pekka Kuusisto began his Artistic Partnership with the Mahler Chamber Orchestra in July 2018 with an open-air performance at the Audi Sommerkonzerte in Ingolstadt. 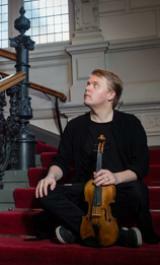 This wonderfully versatile Finnish violinist and “one-of-a-kind” musician will expand his work with the MCO over the coming seasons, covering a wide spectrum of concept-based projects which include play/lead performances, concerts featuring a mix of different musical styles, and formats which encourage discourse between musicians and audiences.